Cultural Exchange » Tekee Media Inc.
“Freedom of Expression” is a painting that powerfully expresses the spirit and soul of Timor (klamar) and, as such, we believe it deserves to be hung in a public place for all Timorese and visitors to view and enjoy. We are inviting individuals and organisations to become involved in this worthy project by joining a consortium to purchase the painting for display in a place of prominence, in a significant museum in East Timor. This large, imposing, oil on canvas painting, is a worthy testament of Timorese traditional heritage in a contemporary setting. 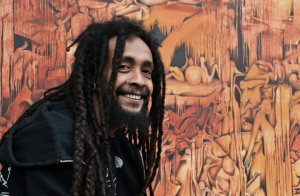 Tony is a Timorese artist who studied at the National Art School in Sydney and now exhibits his work internationally. In July this year, he held an exhibition in Sydney that included this very significant and meaningful painting. An image of the painting along with the artist’s biography and statement on the work can be viewed below. If you donate online, please write Freedom of Expression – or Painting as reference to the deposit and send an email to rosdunlop@tekeemedia.com with the amount you have donated so you can be sent a receipt. Your name will be also be added to list of donors to be displayed with the painting. If you wish your donation to remain anonymous, please advise when you email Ros. The cost of the painting is $7,500 . Thank you for considering this investment in Timor’s cultural heritage and we will keep you posted on our progress. Tony Amaral is a visual artist. He was born in Timor-Leste in 1984 and grew up in Dili, Timor-Leste during the time of the Indonesian occupation. His first teacher was the Indonesian artist Yahya Lambert who lives in Timor-Leste. Tony joined Arte Moris Free Art School in Dili in 2002 as one of the first students of the school, (founded by Swiss artist Luca Gansser and his wife Gabriella). The art school began as a collective of artists who lived and worked in the grounds of Arte Moris. During this time Tony took part in many projects and exhibitions, nationally and internationally. He travelled with exhibitions to Australia, Indonesia and Switzerland. During the civil unrest in 2006 he took part in the peace campaign of posters and Murals throughout Timor to help restore peace to the troubled country. His work hangs in the Presidential Palace in Dili, East Timor. In 2008 he was awarded a scholarship to study art at The National Art School in Sydney, Australia. He was the first Timorese artist to graduate from the National Art School. He attained a Bachelor of Fine Art in 2011. He was also awarded the Chroma Prize for Painting in his final year. After graduation he returned to East Timor as Artist in Residence at Arte Moris Art School, he is now the artistic director of Arte Moris. In this capacity he has curated a number of exhibitions, served as an inspiration and mentor for artists and students in his homeland. He gave his first solo show in Dili in October 2011 called Dame ba rai nebe’e maka iha problema – Peace to this troubled land. It was the first solo exhibition by a Timorese artist in Timor. The exhibition used mixed media abstract collages with a focus on local newspaper cuttings and bold colours and stencils to tell a story of a nation that is continuing to experience a crisis of faith in development and governance, which in turn is having an impact on people’s sense of harmony. This exhibition was received with critical acclaim. In 2012 he gave his first solo exhibition in Sydney At The Vanishing Point gallery in Newtown. He was also invited to participate in the 15th Asian Biennale in Bangladesh, and was the first Timorese artist to participate in this Biennale. Growing up in a country under occupation has had a profound influence on Tony, expressed through his art. The relationship between me and my art is not far from my lulik. A lot of the ideas in my new work are about the traditional belief system of the Timorese, which is called lulik. Lulik is at the soul of the traditional animist religion of the Timorese. Symbols of this religion can be found in my work, for example; rocks, trees, the cosmos and the ancestors. When I was little, my family would do things together. At night time my father would point to the stars and tell me that all the stars were avo (grand parents), he also showed me which ones were abo fulan (the moon), abo fitun (the stars) and abo tasi (the sea). When I moved to Arte Moris with my fellow art students and the founder, Luca Gansser in 2003 we found more than 50 rocks, old rocks which described a family, a mother holding a child, the father and the family, these were lulik rocks. This was an old sculpture which had been part of the Indonesian Museum. I paint my tradition, the ancestors, the spirits, but I never have seen them, these things are from the old lulik. I like to paint about something that I am scared of, and something that I never imagined. I paint from the stories I am told; for example, when I was little grownups might say ‘be careful with the dark’, and then mention someone who has died, or an ancestor with one eye, or a certain name. Then they would say, you might dream or see this ancestor and Timorese revere their ancestors. I have never seen my old lulik because of the new religion, (Catholic). Timorese have two ways of believing, Catholic and animism and the two often get mixed up. In the districts the people might do old lulik before the mass starts. Some traditional symbols of animist religion often decorate the outside of the Catholic churches in Timor. I have never seen my old lulik but as an artist I do have my own lulik which I have expressed in my recent artworks.